On June 11, 1937, Eleanor Roosevelt kicked up her heels with the homesteaders at Penderlea. The First Lady visited Pender County to check on the progress at one of her husband Franklin’s premier homestead sites. During the depths of the Depression, Wilmington industrialist Hugh MacRae conceived the idea of creating a model farm community at Penderlea on a grand scale. 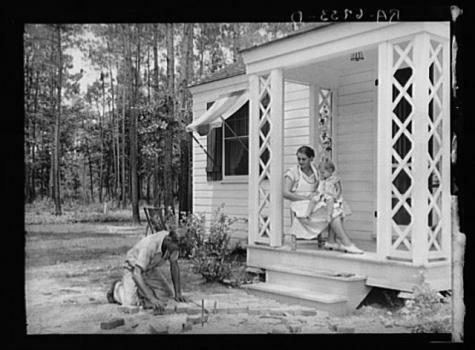 He had experimented with similar communities across southeastern North Carolina early in the 20th century. The intention at Penderlea was to build the “best planned rural community in the world.” A tract of 10,000 acres was set aside, land was cleared and homes and a community center were built. MacRae disagreed with those in Washington as to how Penderlea should be managed, and, in May 1934, the entire program was federalized. Though Roosevelt and his New Dealers were pursuing similar programs across the country, no other rural project was as large as Penderlea, though the original goal of 500 20-acre farms was never met. A total of 142 units were leased but, by 1941, few of the original homesteaders remained. Memories of the experiment remain vivid at Penderlea, where a large community building remains. Visit: The Penderlea Homestead Museum near Willard preserves the story of Penderlea to this day.